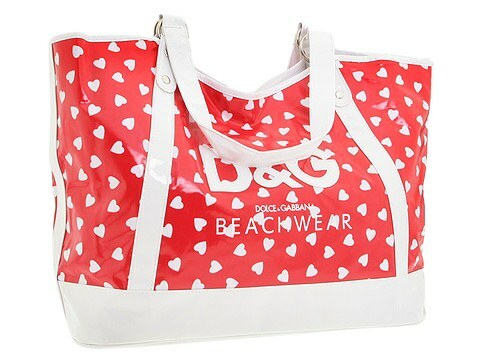 If you're the type of fashionista that demands high style no matter where you go, then this beach tote from D&G is for you. Made clear vinyl with contrasting synthetic patent trim. 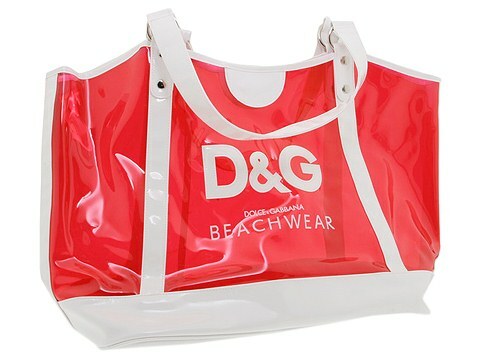 Holds a towel, sunscreen, a change of clothes, a pair of sandals and a bottle of water. Dimensions: 17 wide across bottom, 24 wide across top x 8 1/2 deep x 14 1/2 high. ; Dual shoulder straps. Shoulder drop: 9 1/2 length. Removable zip pouch. Signature printed logo. Platform bottom. Magnetic snap closure.